Neanderthals survived on a monotonous diet of horse and reindeer meat, the findings of research suggest. 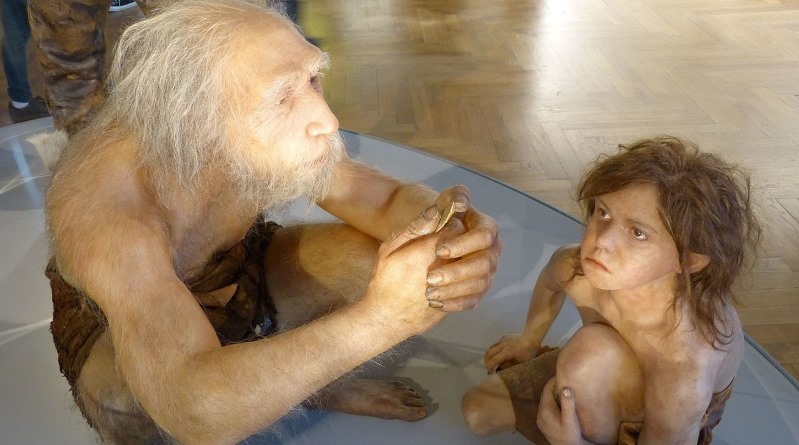 The diet of Neanderthals has been at the center of recent academic debate. They are traditionally considered carnivores and hunters of large mammals, but this has recently been challenged by evidence of plant consumption. Ancient diets are often reconstructed using nitrogen isotope ratios that reveal the position an organism occupies in a food chain. Neanderthals have been shown to be well up the food chain, showing slightly higher ratios than the ancient remains of carnivores, such as hyenas, wolves or foxes, found at the same sites. A specific feature of modern humans seems to be their frequent fish consumption, which can be determined by nitrogen isotope analyses of bone or tooth collagen. Indeed, Paleolithic modern humans who arrived in France shortly after the Neanderthals had disappeared exhibited even higher nitrogen isotope ratios than Neanderthals. When researchers at the Max Planck Institute for Evolutionary Anthropology in Germany and their collaborators discovered high nitrogen isotope ratios in the collagen of two Neanderthals falling in the range of modern humans, they wondered whether this could be a signature of regular fish consumption. However, by studying the isotope ratios of single amino acids, they have now shown that instead of fish, the adult Neanderthal had a diet relying on large herbivore mammals, especially reindeer and horses. The work showed the other Neanderthal, a one-year-old breastfeeding baby, had a mother who was a carnivore. According to isotope data, neanderthals seem to have had a very stable diet over time, including after the arrival of modern humans in Europe. The Neanderthals whose remains underwent analysis came from Les Cottés and Grotte du Renne, in France, two sites where no fish remains have been found. The measurements were performed on a tooth root, of the adult, which recorded the diet between four to eight years of the individual’s life, and on a bone from the baby. In order to explain these exceptionally high nitrogen isotope ratios, first author Klervia Jaouen and her colleagues decided to use a new isotope technique. It enabled the study team to separately analyze the amino acids contained in the collagen. Some of the amino acid isotope compositions are influenced by environmental factors and the isotope ratios of the food eaten. Other amino acid isotope ratios are also influenced by the position in the food chain. The combination of these amino acid isotope ratios allows researchers to decipher the contribution of the environment and the position in the food chain to the final isotope composition of the collagen. “Using this technique, we discovered that the Neanderthal of Les Cottés had a purely terrestrial carnivore diet: she was not a late weaned child or a regular fish eater, and her people seem to have mostly hunted reindeer and horses,” Jaouen says. “We also confirmed that the Grotte du Renne Neanderthal was a breastfeeding baby whose mother was a meat eater”. The study shows that the isotope technique could prove invaluable for future investigations into ancient human and Neanderthal diets. The technique allowed the researchers to avoid misinterpreting the global nitrogen isotope ratio which was exceptionally high. Michael Richards, of the Simon Fraser University in Canada, who was also involved in the study commented: “Previous isotope results indicated a primarily carnivorous diet for Neanderthals, which matches the extensive archaeological record of animal remains found and deposited by Neanderthals. “There has recently been some frankly bizarre interpretations of the bulk isotope data ranging from Neanderthals primarily subsisting on aquatic plants to eating each other, both in direct contrast to the archaeological evidence. The evidence suggested the diet may have proved monotonous over time, even once their lifestyles began to change, possibly under the influence of modern humans. The baby Neanderthal of Grotte du Renne was indeed found associated with the Châtelperronian, a lithic technology similar to that of modern humans. Late Neanderthals were therefore very human-like, painting caves and wearing necklaces, but unlike their sister species, did not seem to enjoy fishing. Jean-Jacques Hublin, director of the Department of Human Evolution at the Max Planck Institute for Evolutionary Anthropology, commented: “This study confirms that when Homo sapiens arrived in Europe and met Neanderthals, they were in direct competition for the exploitation of large mammals. “The systematic use of the combination of CSIA and radiocarbon dating will help to understand if the two species really had the same subsistence strategies during those crucial times,” concludes Sahra Talamo, a researcher at the institute.